Listen to this author's credentials: Master of Science in exercise physiology and nutritional sciences, an honors degree in kinesiology, and certified by the American College of Sports Medicine and the Canadian Society for Exercise Physiology. Think he knows a thing or two about diet and exercise? He, like so many others, came to the conclusion that "most diets and weight loss strategies are quick-fix programs based on half-truths and flat-out fabrications". We've all heard about drastic weight loss only to be replaced by all the lost weight, and more. All together now: DIETS DON"T WORK. Ask anyone who's had a longlasting weight loss - it's what they eat, how much they eat, and exercise. This book is a follow-up to Pasternak's first book, 5-Factor Fitness, and features testimonies from many of his celebrity clients. Now he spills the beans on the nutritional and exercise aspects of his program. He also dissects the other popular diets and exposes their flaws and downfalls. Some diets can play havoc on your body and organs. The 5-Factor Diet has five (naturally) components you need to eat every day - not the same foods every day - a huge difference, and using this combination will help to decrease stress and mood swings. And there's no cutting out carbs or protein or the like. Pasternak deftly lists the best foods for us and their benefits, offers recipes for healthy eating, five weeks worth of menus, and a series of 5x5-minute exercises for 5 days a week. The meals include Spaghetti and Meatballs, Southern-Style Baked Chicken with Black-Eyed Peas and Collard Greens, Smoked Salmon Mousse, and many more yummy recipes. 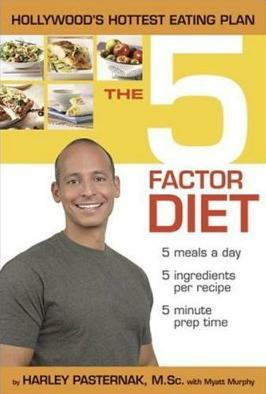 Visit Harley Pasternak at his website for more information. Conclusion - Very informative and sounds pleasant enough to follow. An essential guide most everyone can use - we have to eat healthier meals and food.